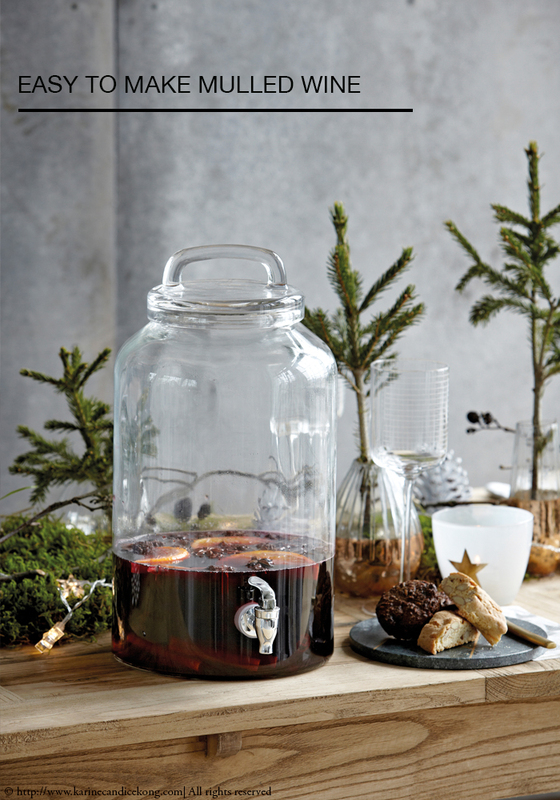 December, on this side of the hemisphere and especially in London, is nothing without a few evenings fuelled with mulled wine and good friends so I thought I would share with you my favourite mulled wine recipe which you can serve in this glass dispenser, which is not only gorgeous looking but you can also use it during Summer for lemonade. It will take you 20 min top and it’s the perfect drink to warm up after a chilly day. It kind of feels a bit sangria-ish but not as sweet and I think it’s a great drink to prepare ahead if you have friends around. This recipe is for about 4 glasses so to fill up this glass dispenser which can contain 8.5 Lt, you can take all these ingredients and multiply them by 7 or 8. Pour all the ingredients in a big saucepan and bring to a simmer over medium-high heat. Then reduce heat to medium-low and let simmer for at least 15 minutes. I usually leave a lid on to keep the goodness inside the saucepan. Strain and serve warm. If you leave it in this dispenser for your guests to help themselves, then you don’t need to strain it because the slices of orange and the cinnamon sticks will look really nice and make your table very festive!